An efficiently functioning bathroom is a very important thing, and so is a commitment to the health of our planet. 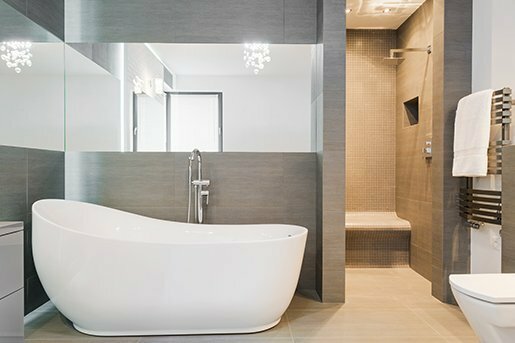 So, when you need to replace a fixture or want to remodel, you’ll be interested in recent trends in bathroom plumbing fixtures that address both concerns. WaterSense is a voluntary partnership program initiated by the EPA in 2007 with the goal of protecting the future of the U.S. water supply. At first focused on reducing the amount of water used when flushing toilets, WaterSense has now developed specifications for bathroom faucets and shower heads, among other things. Any bathroom fixture that has the WaterSense label reliably meets the EPA’s standards for performance and efficiency. Things have come a long way since the first low-flow fixtures hit the scene. Everyone hated the early versions of low-flow toilets because they didn’t handle waste well at all. Today’s gravity-assisted toilets, however, ensure a greatly improved cleaning action. Wider flapper valves (the hole in the bottom of the tank where the water flows into the bowl) and trapways (the hole at the bottom of the toilet bowl), together with smoother, frictionless finishes, all ease the process. Pressure-assisted flush toilets use pressurized air in the tank to forcefully push water into the bowl, which helps clean things up much more effectively. While this type of toilet works very well in disposing of solid waste, it does tend to be a little noisier. Some models need an electrical power source, which could mean more maintenance and higher installation costs if there isn’t an outlet nearby. If you need to replace your toilet, consider dual flush technology, which has two flushing options: 0.8 gallon of water for liquid waste and 1.6 gallons of water for solid waste. Hard to find a few years ago, almost all major toilet manufacturers now offer dual-flush models. Look for units with a lever that you lift up or push down according to need; they are easier to use than units with dual pushbuttons, which are recessed and require more manual dexterity and strength to operate. Before conservation standards mandated lower water consumption, a shower head used as much as five gallons per minute. Shower heads that have a WaterSense label use no more than two gallons per minute at a standardized pressure of 80 psi (pounds per square inch) and, at the same time, deliver a reliably forceful spray. Many low-flow shower heads use even less water, with technology that manages droplet size, velocity and coverage, among other things. They also offer a wide range of options to enhance your shower experience. Keep in mind that not every building has water pressure as high as 80 psi. Levels substantially lower than that can make a dramatic difference in the effectiveness of the shower spray. If your plumber cannot raise your water pressure, you can find water-efficient models designed specifically for low water pressure situations. Touch-less sink fixtures are increasingly popular. They feature a sensor at the base of the faucet: Water flows when a hand moves directly in front of the sensor and stops when that action ends. Most no-touch faucets can be programmed to a certain temperature and rate of water flow. In addition to being a water-saving device and a safety feature in households with small children, hands-free faucets minimize the buildup of dirt, bacteria and soap scum on the handles and adjacent areas. Some faucets use batteries, while others plug in to outlets, and have battery backup. Unless you have an existing outlet close by, choose a battery-powered faucet to keep installation costs down. If you need to install an outlet, you will have to call in a licensed electrician as well as a plumber, which will increase the faucet’s cost significantly. These improvements to the efficiency of standard fixtures do not come at the expense of aesthetics. Manufacturers offer a wide range of styles and finishes that will complement your style and your budget. So, if it’s time to replace or renovate, rest assured: You’ll find a broad selection of options that keep things flowing smoothly in your bathroom, and keep your water bills down.